A young boy, an angry grandfather and a past hurt, so wide, the chasm that separates family members might not be breached – even in the midst of a family crisis. That's the setting Dan Walsh's novel, The Unfinished Gift, set a week before Christmas in 1943, during World War II. “Christmas is a time we mostly associate with joy and presents and family traditions,” Walsh said. “Yet for many it's a time that merely highlights the brokenness in their family lives. All around us are reminders of how happy it should be, but these things only remind us how far off track our own story has become. The real focus of the story, Walsh explained, is the backstory – the fractured relationship between the grandfather, Ian Collins, and Patrick’s father, Shawn. In The Unfinished Gift, Walsh tried to present a way out of this vicious cycle. Walsh created The Unfinished Gift after watching several classic movies, including It’s a Wonderful Life and A Christmas Carol, during Christmas 1998. “I wanted to write a story like that, one that at least had the potential to affect others the way these stories affect me,” Walsh said. “The whole thing came to me over two or three days. I actually saw the ending of the book first, like a scene from a movie playing in my thoughts. Walsh set the book during World War II, because it is one of his favorite historical periods. As the manuscript began to unfold, other benefits of a World War II setting began to emerge. “[During World War II] the country was so different,” Walsh said. “We were unified, life itself was much simpler and faith was a normal part of life. The setting has allowed the novel to reach readers in both the churched and unchurched audiences. “I've gotten many emails from readers saying they felt they could easily buy the book as a gift to someone they're trying to reach,” Walsh explained. Walsh said he hopes readers will find a book that they love to read. He also hopes they are reminded that with God, anything is possible. “No heart is too hard for Him to reach, no distance too far for Him to close. Add to that, a fresh perspective of the power of forgiveness," Walsh said. 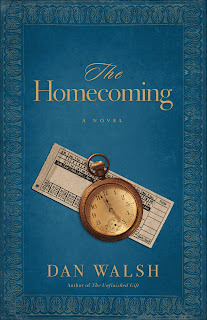 In June 2010, Walsh’s sequel to The Unfinished Gift, The Homecoming, will be released. Walsh has completed his third novel, tentatively titled The Deepest Waters. Inspired by a true story, the novel is set in 1857, and involves a newlywed couple and a shipwreck. “We get to travel back to the beginning days of San Francisco, spend time in old New York and experience life out on the open sea,” Walsh said. He said the novel has been received well by his agent and editor, and it may be expanded into a mulit-book deal. I really liked this book. It carries a simple, yet timeless message regarding the importance of family relationships.I also liked having the chance to step back into time, to when life seemed "simpler." Through the book, Walsh has developed a cast of characters that you'll feel like you know - a woman who has a passion for helping young children, a little boy facing a devastating loss, a grandfather who has to face his past to move into the future, and a neighbor determined to help carry out her friend's dying wish. I could easily see this novel being turned into a "made for TV movie," because it has a message of love and redemption that crosses the generations. 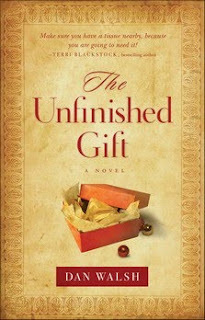 If you are looking for a book to curl up with (along with a cup of hot chocolate), then check out "The Unfinished Gift." I think you'll find it is a good read. The Unfinished Gift is set in 1943, a week before Christmas. Patrick’s mother has recently died in a car accident and he is being sent across town to stay with a grandfather he’s never met while the Army tries to locate his father, a bomber pilot in England. Patrick’s father and grandfather haven’t spoken since before Patrick was born. The book explores the surprising things God uses to affect powerful changes in our hearts; like a little boy’s prayers, a shoebox full of love letters, and an old wooden soldier collecting dust in a grandfather’s attic. Dan Walsh is the senior pastor of Sovereign Grace Church in Daytona Beach, Florida, a church he helped found 23 years ago. He is the author of The Unfinished Gift and lives with his family in the Daytona Beach area. "I am an author who loves solitude but needs and likes people," explained Walsh. "I love quiet but also a roomful of friends. I love to laugh, make others laugh and even be laughed at (to a point). But I'm also a sap; I cry way too easily watching movies and inspirational shows. "But I also like to watch action movies with my son. I eat just a little too much but don't exercise near enough. Finally, I'm nothing without my wife and my Savior's love." His Favorite Character in The Unfinished Gift: Mrs. Fortini, the Italian grandmother who lives next door. If you read the book...how can you not like her? Download a PDF Excerpt: Click here! No sooner is Shawn Collins home from the fighting in Europe than he is called upon to serve his country in another way--as a speaker on the war bond tour. While other men might jump at the chance to travel around the country with attractive Hollywood starlets, Shawn just wants to stay home with his son Patrick and the aging father with whom he has finally reconciled. When Shawn taps Katherine Townsend to be Patrick's nanny while he's on the road, he has no idea that she will be the key to his future happiness and the mending of his heart. Editor's Note: I wrote this article during the summer of 2007, while employed with GateHouse Plus, then a division of GateHouse Media. The article was designed as a Faith & Values feature which could be used by any of the newspapers within the GateHouse Media newspaper chain. I dug it out of the "archives" at the request of a friend, who used the idea of a complaint free world in a Thanksgiving sermon. A ripple that will change the world is how the Rev. Will Bowen describes what is happening at his church. What began as a life-lesson for members of his Kansas City congregation about living a complaint-free life has now spread into all 50 states and more than 60 countries. The initiative began small. 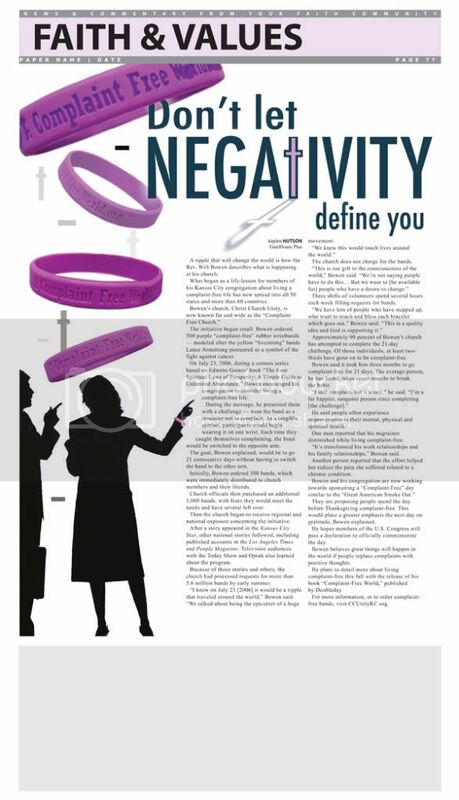 Bowen ordered 500 purple “complaint-free” rubber wristbands — modeled after the yellow “livestrong” bands Lance Armstrong pioneered as a symbol of the fight against cancer. On July 23, 2006, during a sermon series based on Edwene Gaines’ book “The Four Spiritual Laws of Prosperity: A Simple Guide to Unlimited Abundance,” Bowen encouraged his congregation to consider living a complaint-free life. During the message, he presented them with a challenge — wear the band as a reminder not to complain. As a tangible symbol, participants would begin wearing it on one wrist. Each time they caught themselves complaining, the band would be switched to the opposite arm. The goal, Bowen explained, would be to go 21 consecutive days without having to switch the band to the other arm. Initially, Bowen ordered 500 bands, which were immediately distributed to church members and their friends. Church officials then purchased an additional 1,000 bands, with fears they would meet the needs and have several left over. Then the church began to receive regional and national exposure concerning the initiative. After a story appeared in the Kansas City Star, other national stories followed, including published accounts in the Los Angeles Times and People Magazine. Television audiences with the Today Show and Oprah also learned about the program. Because of those stories and others, the church had processed requests for more than 5.6 million bands by early summer. The church does not charge for the bands. Three shifts of volunteers spend several hours each week filling requests for bands. Approximately 90 percent of Bowen’s church has attempted to complete the 21-day challenge. Of those individuals, at least two-thirds have gone on to be complaint-free. Bowen said it took him three months to go complaint-free for 21 days. The average person, he has found, takes seven months to break the habit. He said people often experience improvements to their mental, physical and spiritual health. One man reported that his migraines diminished while living complaint-free. “It’s transformed his work relationships and his family relationships,” Bowen said. Another person reported that the effort helped her reduce the pain she suffered related to a chronic condition. They are proposing people spend the day before Thanksgiving complaint-free. This would place a greater emphasis the next day on gratitude, Bowen explained. He hopes members of the U.S. Congress will pass a declaration to officially commemorate the day. Bowen believes great things will happen in the world if people replace complaints with positive thoughts. He plans to detail more about living complaint-free this fall with the release of his book “Complaint-Free World,” published by Doubleday. For more information, or to order complaint free bands, visit http://www.acomplaintfreeworld.org. To learn more about Bowden's ministry visit CCUnityKC.org. 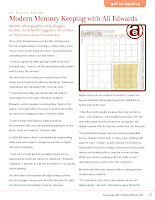 Editor's Note: The following article was previously published in the August 2009 issue of DST Insider, a publication of DigiShopTalk.com. A passion for type, and how it communicates and coveys emotion, led Brian Tippetts to create the book Get Creative with Type. 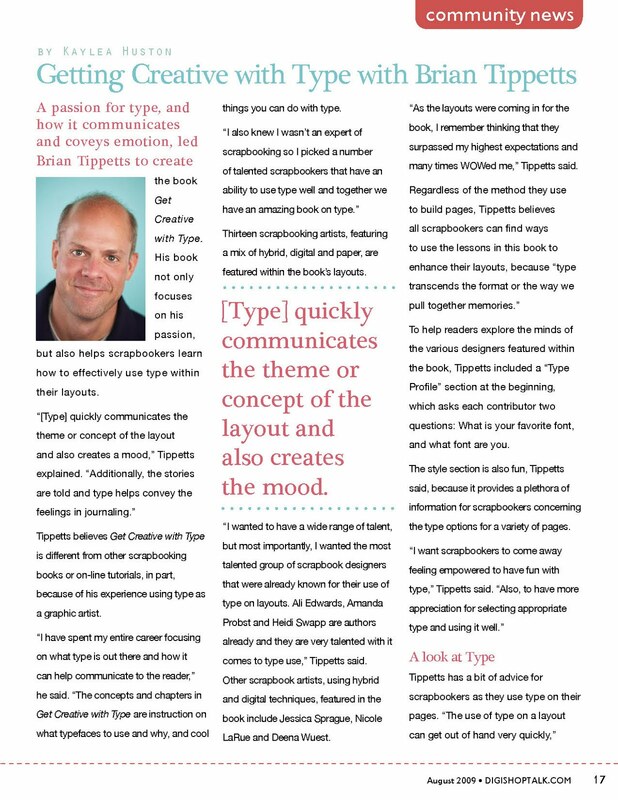 His book not only focuses on his passion, but also helps scrapbookers learn how to effectively use type within their layouts. Get Creative with Type are instruction on what typefaces to use and why, and cool things you can do with type. 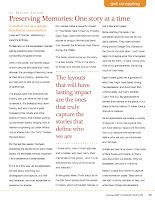 Thirteen scrapbooking artists, featuring a mix of hybrid, digital and paper, are featured within the book’s layouts. 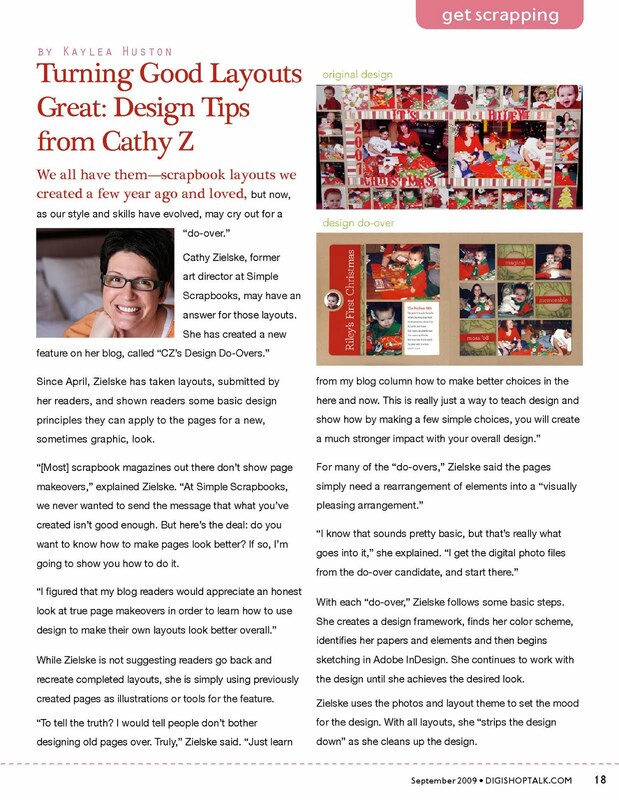 “I wanted to have a wide range of talent, but most importantly, I wanted the most talented group of scrapbook designers that were already known for their use of type on layouts. Ali Edwards, Amanda Probst and Heidi Swapp are authors already and they are very talented with it comes to type use,” Tippetts said. Other scrapbook artists, using hybrid and digital techniques, featured in the book include Jessica Sprague, Nicole LaRue and Deena Wuest. “As the layouts were coming in for the book, I remember thinking that they surpassed my highest expectations and many times WOWed me,” Tippetts said. 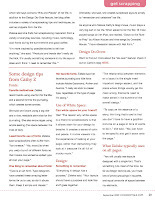 To help readers explore the minds of the various designers featured within the book, Tippetts included a “Type Profile” section at the beginning, which asks each contributor two questions: What is your favorite font, and what font are you. The style section is also fun, Tippetts said, because it provides a plethora of information for scrapbookers concerning the type options for a variety of ages. 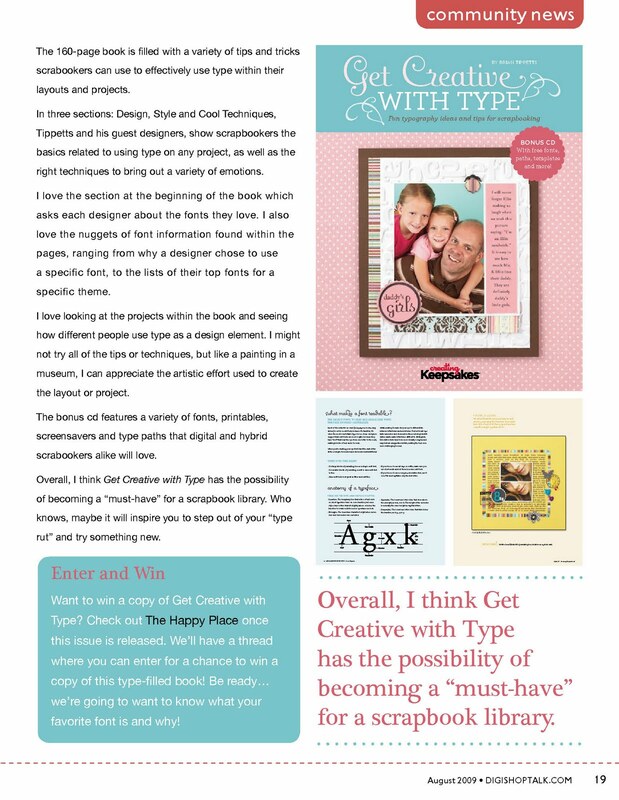 Tippetts has a bit of advice for scrapbookers as they use type on their pages. He suggests, scrapbookers limit their type to one to three typefaces per layout, and instead utilize the “family” of type styles, i.e. bold, italic, thin, condensed, etc. Tippetts said his favorite journaling or clean title font is Gotham. For fun or “funky” layouts, he usually picks Feel Script or Cocktail Shaker – but his choices depend upon the feeling he wants to convey and the potential audience. His favorite type artists include Neville Brody and David Carson, because of their innovative and experimental type treatments. He has found inspiration by font foundries like Adobe, Émigré, House Industries and Font Bureau. 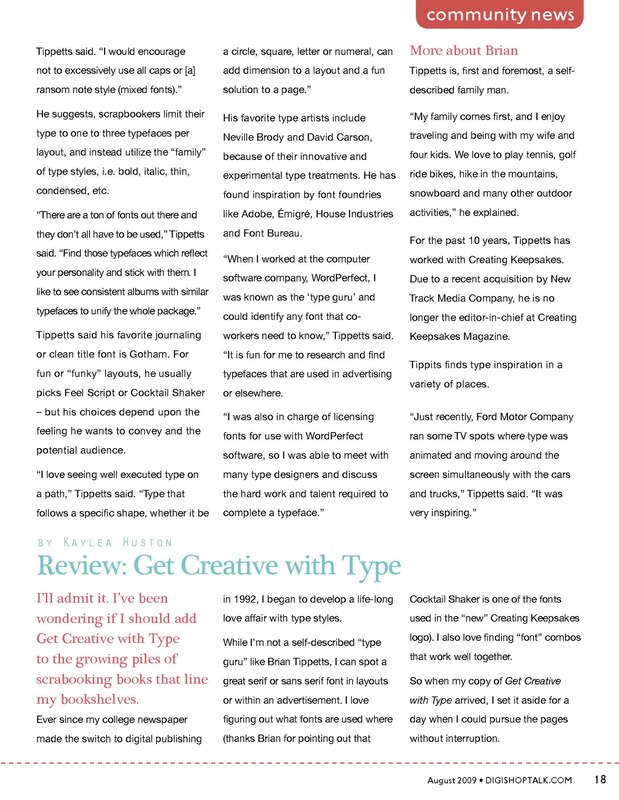 “When I worked at the computer software company, WordPerfect, I was known as the ‘type guru’ and could identify any font that coworkers need to know,” Tippetts said. “It is fun for me to research and find typefaces that are used in advertising or elsewhere. Tippetts is, first and foremost, a selfdescribed family man. “My family comes first, and I enjoy traveling and being with my wife and four kids. We love to play tennis, golf ride bikes, hike in the mountains, snowboard and many other outdoor activities,” he explained. For the past 10 years, Tippetts has worked with Creating Keepsakes. 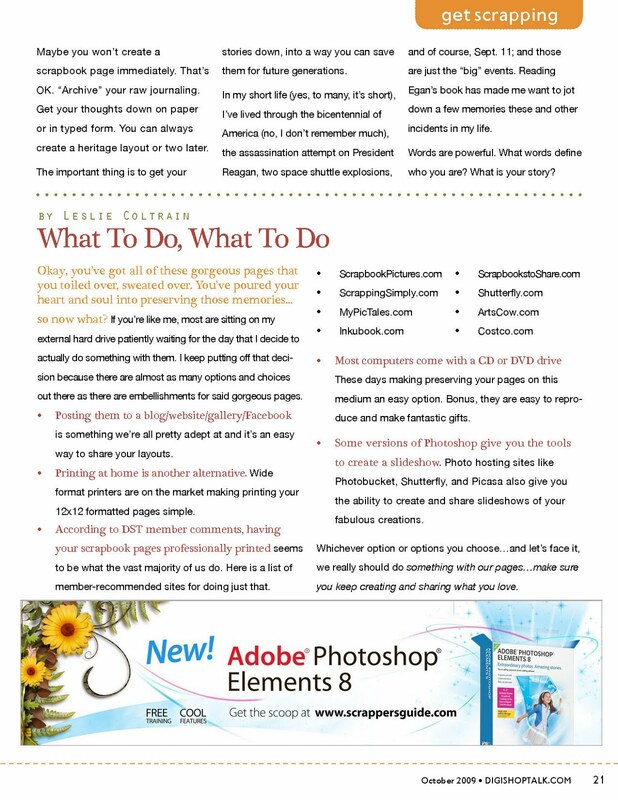 Due to a recent acquisition by New Track Media Company, he is no longer the dditor-in-chief at Creating Keepsakes Magazine. Tippits finds type inspiration in a variety of places. I’ll admit it. I’ve been wondering if I should add Get Creative with Type to the growing piles of scrabooking books that line my bookshelves. Ever since my college newspaper made the switch to digital publishing in 1992, I began to develop a life-long love affair with type styles. While I’m not a self-described “type guru” like Brian Tippetts, I can spot a great serif or sans serif font in layouts or within an advertisement. I love figuring out what fonts are used where (thanks Brian for pointing out that Cocktail Shaker is one of the fonts used in the “new” Creating Keepsakes logo). I also love finding “font” combos that work well together. So when my copy of Get Creative with Type arrived, I set it aside for a day when I could pursue the pages without interruption. 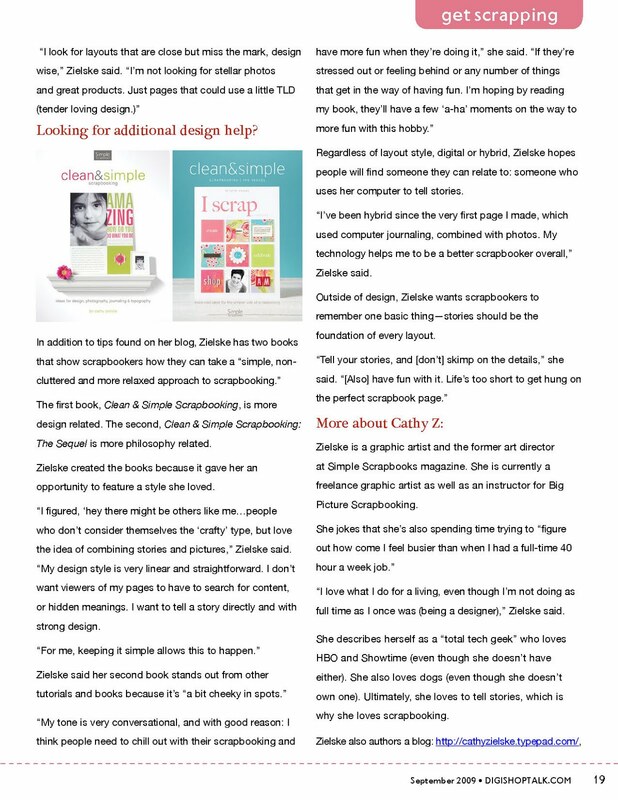 The 160-page book is filled with a variety of tips and tricks scrabookers can use to effectively use type within their layouts and projects. 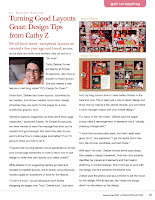 In three sections: Design, Style and Cool Techniques, Tippetts and his guest designers, show scrapbookers the basics related to using type on any project, as well as the right techniques to bring out a variety of emotions. 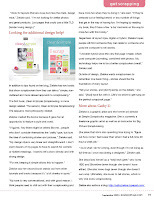 I love the section at the beginning of the book which asks each designer about the fonts they love. 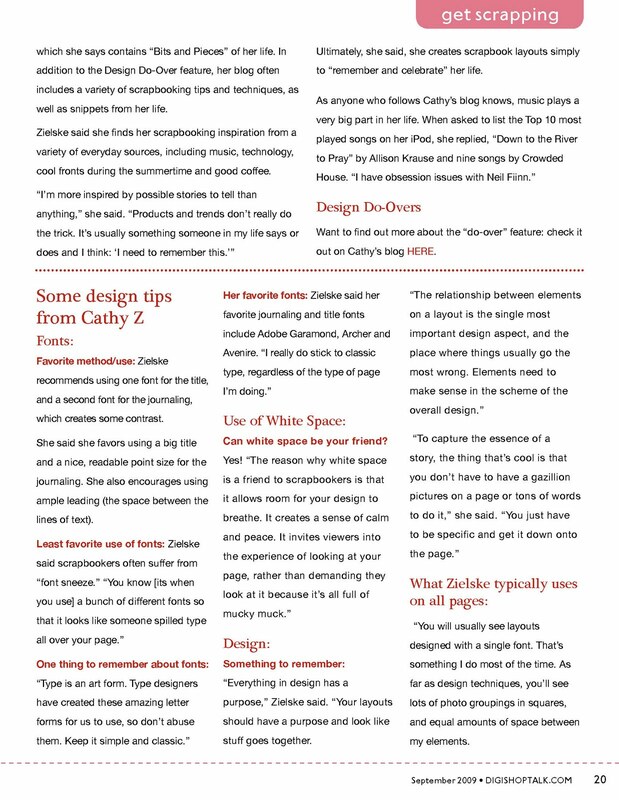 I also love the nuggets of font information found within the pages, ranging from why a designer chose to use a specific font, to the lists of their top fonts for a specific theme. I love looking at the projects within the book and seeing how different people use type as a design element. I might not try all of the tips or techniques, but like a painting in a museum, I can appreciate the artistic effort used to create the layout or project. The bonus cd features a variety of fonts, printables, screensavers and type paths that digital and hybrid scrabookers alike will love. 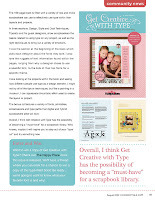 Overall, I think Get Creative with Type has the possibility of becoming a “must-have” for a scrapbook library. Who knows, maybe it will inspire you to step out of your “type rut” and try something new. 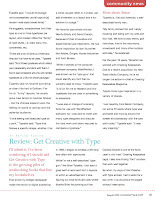 As a freelance journalist, I was provided a copy of "Get Creative with Type" by CK Media. This column/feature was not influenced by a free book - just in case you (or the FTC) were worried about ths detail. 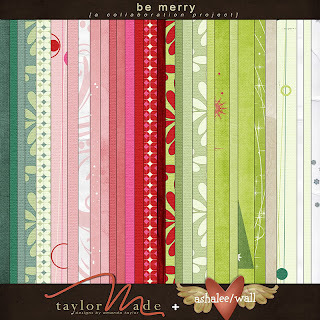 I was inspired by "Be Merry" - a new digi scrapbooking kit by Ashalee Wall and Amanda Taylor (TaylorMade Designs) at Oscraps.com - to do a quick re-design of my blog. Here's a closer look of the entire kit.....which goes on sale today, Black Friday, at Oscraps.com. 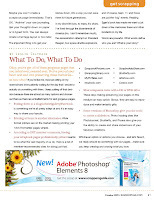 Editor's Note: The following articles were previously published in the Nov. 2009 issue of DST Insider, a publication of DigiShopTalk.com. For her, scrapbooking is more than a crafty hobby, it is a way to focus on two things she loves: documenting and celebrating life’s various ups and downs. “I hope that I am telling the stories that will really be meaningful down the road,” Edwards explained. Edwards’ current passion involves getting “back to the basics” of scrapbooking, focusing on photos and words, as well as encouraging people to tell their stories. “There is magic that happens when a photo is accompanied with your own personal perspective on the photo, event and memory,” Edwards said. 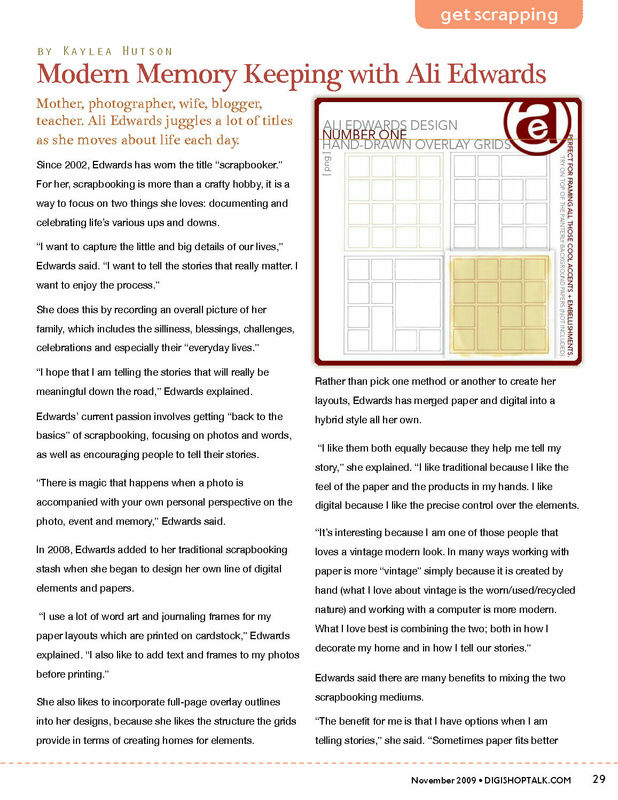 In 2008, Edwards added to her traditional scrapbooking stash when she began to design her own line of digital elements and papers. She also likes to incorporate full-page overlay outlines into her designs, because she likes the structure the grids provide in terms of creating homes for elements. hybrid style all her own. “I like them both equally because they help me tell my story,” she explained. “I like traditional because I like the feel of the paper and the products in my hands. I like digital because I like the precise control over the elements. Edwards said there are many benefits to mixing the two scrapbooking mediums. 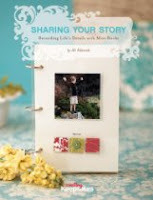 Regardless of method, Edwards said the most important thing a scrapbooker can do is to record family memories. complicated than they need to be. Edwards said scrapbooking continues to evolve to reflect the age in which the hobbyist lives. While many scrapbookers focus on “large” projects, Ali Edwards often creates mini scrapbooks, which focus on specific events or holidays. 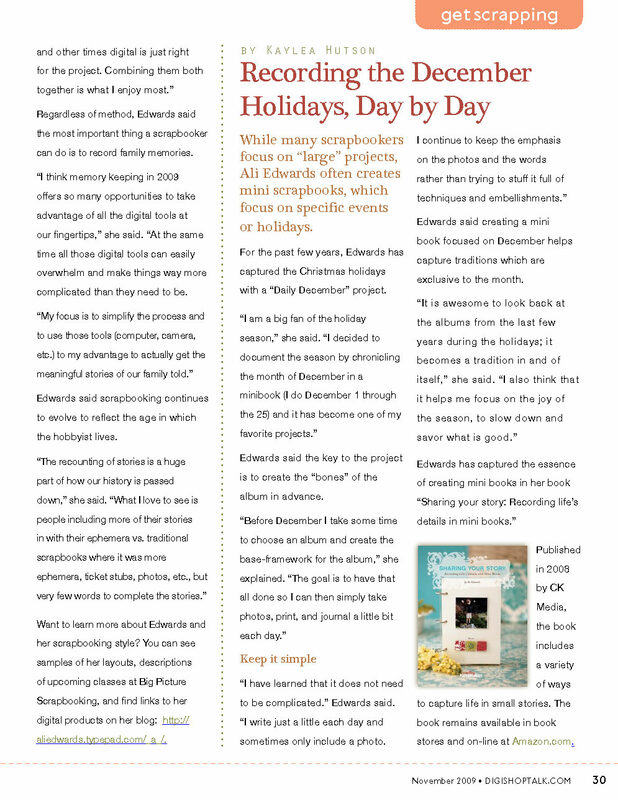 For the past few years, Edwards has captured the Christmas holidays with a “Daily December” project. Edwards said the key to the project is to create the “bones” of the album in advance. 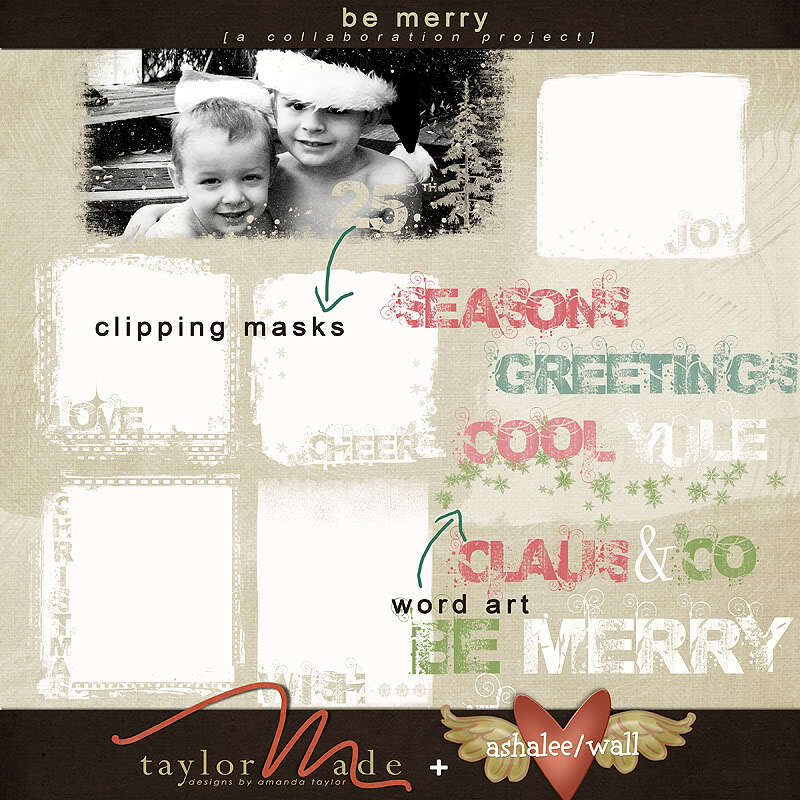 Edwards said creating a mini book focused on December helps capture traditions which are exclusive to the month. Published in 2008 by CK Media, the book includes a variety of ways to capture life in small stories. The book remains available in book stores and on-line at Amazon.com. As a freelance journalist, I was provided a copy of this book by Ali Edwards. This column/feature was not influenced by a free book - just in case you (or the FTC) were worried about this detail. Editor's Note: The following article was previously published in the October 2009 issue of DST Insider, a publication of DigiShopTalk.com. It started out as a simple lunchtime conversation. I was with friends, celebrating a parent’s birthday. To help spur on the conversation I started asking questions about memories surrounding the guest of honor. After a few jokes, the stories began to swirl around the table and I was allowed the privilege of learning more of their family history—stories that are told and re-told during a variety of gatherings. I’ve always said that everyone has a story, you just have to find a way to record it. It’s probably why I love history, and why I found myself bypassing the novels and other works of fiction, and instead picking up nonfiction books, ranging from a memoir of growing up under Hitler’s rule to stories from the “dirty” thirties, the dust bowl. For the last few weeks, I’ve been absorbing the stories found within these books. It’s reminded me how important it is to preserve our family stories. Think of it this way. As scrapbookers we talk about archiving our photographs and layouts, but first and foremost, we must remember to preserve our stories. Our stories make a powerful impact. In “The Worst Hard Times” by Timothy Egan, Egan uses interviews and family stories to bring to life the dust bowl that covered the American High Plains during the 1930s. To the grave. Wow. Think about all of the first-hand accounts of this period in history which will be lost, forever, in just a few short years. was like for them. In fact, I know very little of my grandparents’ life during much of their lives. Egan’s book gives me a glimpse of what they might have faced during the depression and dust bowl. But, unfortunately, like many families, I can’t find out. My grandparents carried their stories to the grave. It’s a piece of family history I’ll never have a chance to capture. 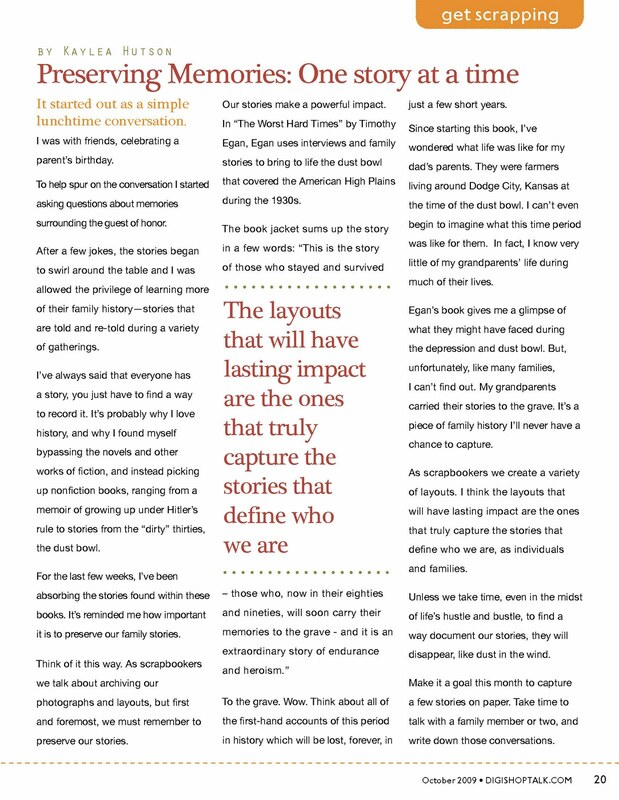 that truly capture the stories that define who we are, as individuals and families. disappear, like dust in the wind. Make it a goal this month to capture a few stories on paper. Take time to talk with a family member or two, and write down those conversations. Maybe you won’t create a scrapbook page immediately. That’s OK. “Archive” your raw journaling. Get your thoughts down on paper or in typed form. You can always create a heritage layout or two later. The important thing is to get your stories down, into a way you can save them for future generations. In my short life (yes, to many, it’s short), I’ve lived through the bicentennial of America (no, I don’t remember much), the assassination attempt on President Reagan, two space shuttle explosions, and of course, Sept. 11; and those are just the “big” events. Reading Egan’s book has made me want to jot down a few memories these and other incidents in my life. Words are powerful. What words define who you are? What is your story? I have a lot to be thankful this year. A note from my cousin, reminded me of this fact. One of the things I'm thankful for is posted above. I'm thankful for all of the kiddos I come in contact with in my children's ministry. 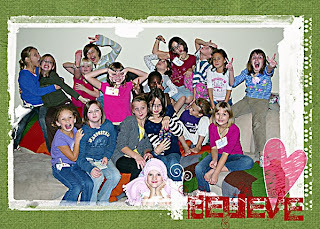 The photo above is from last week's "Girl's Thing" sleep over. Yes, I was either a "brave" or "crazy"
children's pastor - depending upon who you ask - and had a sleep over for 18 elementary aged girls. My attitude isn't always the best, and I'll admit, I struggle with remembering to look at life as a glass half full, rather than empty. So, I'm working to adjust my attitude, to live with a life of gratitude. I'm sure it will make life more enjoyable. So, Happy Thanksgiving everyone - I'm off to the church to take pics at the community Thanksgiving dinner, then I'll head over to the Palmers for a yummy late lunch. Editor's Note: This feature ran in the Wednesday, Nov. 18, issue of the Siloam Springs Herald-Leader. SILOAM SPRINGS — The smile never left Billie Doublehead’s face as she wrapped boxes during the Operation Christmas Child Community Shoebox party,held Saturday at the First United Methodist Church in Siloam Springs. Doublehead was just one of numerous volunteers who helped wrapand fill 353 shoeboxes during the two-hour event. This is the sixth year for the community party. Organizer Lane McLoud said this was the most boxes filled during a single event. Many volunteers, including members of the men’s basketball team at John Brown University, helped staff carnival games, which let children win prizes, like crayons, pencils and candy. Those items were thenused to fill many of the shoeboxes. Sheehy said team members were excited to help with the project. He hoped his players walked away from the event knowing how much fun they can have while serving others. This was Andrea Hair’s third community shoebox party. The junior at JBU became involved with OCC in high school, when members of her home church traveled to a regional processing center in Minneapolis, Minn. Hair has enjoyed volunteering with OCC so much, she eventually hopes to work for the ministry after graduating from JBU. Another volunteer, Fran O’Neal, took time to create a note for one of her completed boxes. O’Neal became involved with the organization approximately 12 years ago. “It’s fun to bless people who don’t have anything,” O’Neal said. In addition to participating in the event at First UMC, Doublehead has spent the last year purchasing items at rummage and clearance sales to fill boxes at her home. Last week she invited neighborhood children to help bag candy and make cards for approximately 100 boxes in anticipation of this week’s OCC National Collection drive. Doublehead’s boxes, along with those made at First UMC, will be taken to the local Operation Christmas Child collection site at Sager Creek Community Church for further processing. The church, located at 1600 Cheri Whitlock Drive, will collect boxes from 4 p.m. to 7 p.m. today through Friday, and from 1 p.m. to 4 p.m. Saturday and Sunday. For more information, call 524-3577. 1) Samuel Johnson, a freshman member of the John Brown University men’s basketball team, signs Karson Clement’s shirt during the annual community shoebox party. As he played the various carnival games, Clement asked the basketball players present if they would autograph his JBU t-shirt. 2) Billie Doublehead jokes with Jonathan Sparks, a junior at John Brown University, at the wrapping station. The pair helped wrap shoeboxes, so they could be filled during the carnival. 3) Megan Glen decorates Nate Payne’s face during the annual shoebox carnival. Glen, along with two of her friends, staffed the face painting booth. 4) Fran O’Neal, a long-time supporter of Operation Christmas Child in Siloam Springs, creates a note for the child that will receive her shoebox during the annual community shoebox carnival. 5) Brenton Hilderbrand shows his mother, Johnna, one of the stuffed animals he found in a prize box during the annual shoebox carnival. 6) Cody Thomas organizes a variety of items into his shoebox during the annual shoebox party at First United Methodist Church. 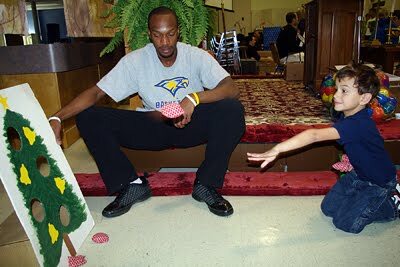 7) Adrian Miller watches as 5-year-old Brenton Hilderbrand tosses a bean bag into a Christmas tree during the annual shoebox party. 8) Sam Young, a freshman at John Brown University, adds a filled shoebox to the completed pile. Volunteers filled approximately 350 shoeboxes during the annual community party at First United Methodist Church in Siloam Springs. 9) Amber Carter helps her daughter, Avery, complete a personal note to go in an Operation Christmas Child Shoebox. In her newest book, Sheri Rose Shepherd as created a plan that steps beyond a typical diet, and instead is a 30-day fast from several things including white sugar, white flower and artificial sweetners. The book also contains 30 days worth of devotions focusing on a variety of topics including anger, hopelessness, loneliness and being real with God. I'll be honest, I cringed a bit when the book arrived in the mail. It had been a bad week, I was feeling a bit overwhelmed with life and other things. The idea of sitting down to read a book about dieting, well, made me want to run to the kitchen to make a bowl of mac and cheese. When I finally cracked open the book, I found a book that was easy to read, thanks to Shepherd's conversational writing style. While I'm not ready to jump into her fast - I'm still trying to break the "fast food" grab and go - I can easily see myself using the devotional plan for the next 30 days. 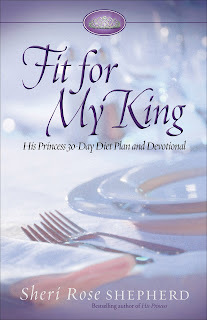 Each devotion comes with a plan, an action plan and a truth treasure, to help reinforce the truth that we are princesses for the ultimate King - God. I think the themes found in the devotions are things all women - regardless of age - need to hear. The other information - from the fast to the recipe - provides things for women to think about. nearly 50 years old, Sheri Rose is healthy and free. of truth found in these pages will transform the way you see yourself forever. The book is available this month (November 2009) at your favorite bookseller from Revell, a division of Baker Publishing Group. Find Out More About the Book - Click Here! Read an Except - Click Here! Find It On Amazon - Click Here! Sheri Rose Shepherd was named the # 1 Show of the year (2006) on Focus on the Family with Dr. James Dobson. Her book, Life is Not a Dress Rehearsal is endorsed by Women of Faith speakers Patsy Clairmont, Barbara Johnson, and Thelma Wells. Her inspiring life story and books have been featured on Lifetime Television for Women and NBC’s Inside Edition. Sheri Rose has a very refreshing way of bringing the Word of God to life. She knows how to renew the Eternal Hope in our hearts. Her speaking style is humorous, heartwarming and inspires every one to make their life count for eternity. Sheri Rose is a woman who can relate to almost any woman’s battle. This former Mrs. United States grew up in a dysfunctional home and was severely overweight as a teen. As a young woman, she battled depression and an eating disorder. She understands the pain that comes from a broken home and she knows what it means to fight for freedom from your past. In spite of an English teacher telling her she was “born to lose” and a learning disorder—Dyslexia—Sheri Rose has (in God’s strength) written best-selling books, founded His Princess Ministries and speaks to thousands each year at churches and women’s conferences. 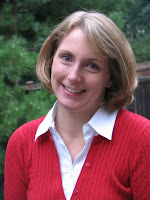 Sheri Rose has written seven books, three of which are best sellers. She travels extensively speaking to approximately 30,000 people each year. Sheri Rose and her husband, Steve have been married 20 years and have two children, Jake, age 19, and Emily, age 8.